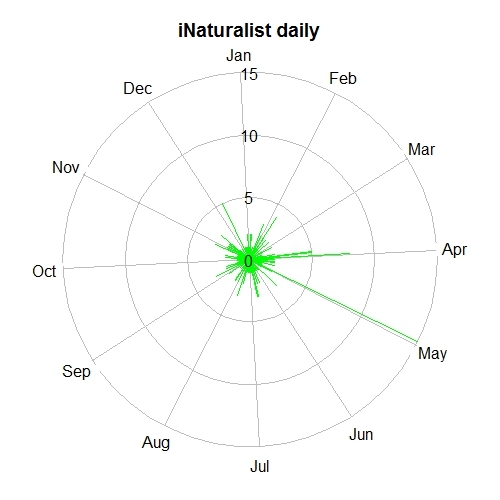 I have been using bdvis package (version 0.2.9) to visualize the iNaturalist records of RAScals project (http://www.inaturalist.org/projects/rascals). Initially, the mapgrid function in the bdvis version 0.2.9 was written to map the number of records, number of species and completeness in a 1-degree cell grid (~111km x 111km resolution). I applied this function to the RASCals dataset, see the following code. However, the mapping results are not satisfying. The 1 degree cells are too big to reveal the details in the study areas. Also, the raster grid was on top the basemap, which makes it really hard to associate the mapping results with physical locations. I contacted developers of the package regarding these two issues. They have been very responsive to resolve them. They quickly added the gridscale argument in the mapgrid function. This new argument allows the users to choose scale (0.1 or 1). The default 1-degree cell grid for mapping. Here are mapping results from using the gridscale argument. Make sure you have bdvis version 0.2.14 or later. We can see that the new map with a finer resolution definitely revealed more information within the range of our study area. One more thing to note is that in this version developers have adjusted the basemap to be on top of the raster layer. This has definitely made the map easier to read and reference back to the physical space. Good job team! Thanks for developing and perfecting the bdvis package. This is the fourth part of the of the post where are going to create figure 4 Plot of Inventory Completeness against sample size for grid cells. Part 3 of this series we created chronohorogram for understanding seasonality by year of the data records. If you have not already done so, please follow steps in Part 1 of the post to set up the data. Since this functionality was recently added to package bdvis, make sure you have v 0.2.9 or higher installed on your system. The first step to generate this plot will be to compute completeness of the data. Package bdvis provides us with a handy function for that, as long as we want to compute the completeness for a degree grid. This was partially covered in an earlier blog post. This command would return a completeness data matrix called comp and generate a plot of inventory completeness values (c) versus number of spices observed (sobs) in the data set as follows. 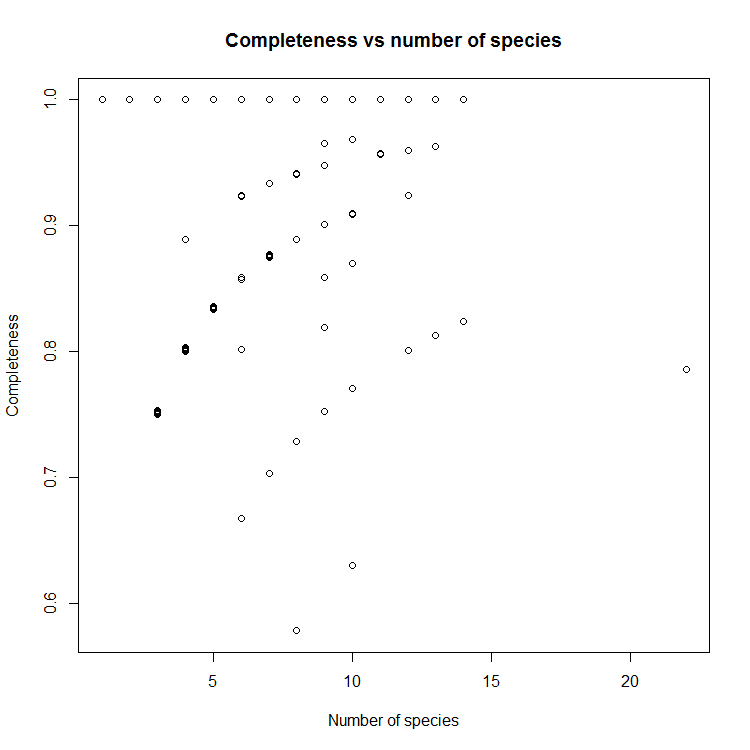 The data returned has cell identification numbers, number of records per cell, number of observed and estimated species and the completeness coefficient (c). The default cut off number of records per grid cell is 50, but let us set that to 100 so we can filter out some grid cells which are data deficient. The graph we want to plot is Inventory Completeness (c) against sample size for grid cells (nrec) and not the one provided by default. The problem with this graph is since there is very high variation in number of records per grid cell, majority of points having less than 5000 records are getting mixed up. So let us use log scale for number of records. Now this looks better. Let us change the x axis labels to some sensible values, to make this graph easy to understand. For that we will remove the current x axis labels by using xaxt parameter and then construct and add the tick marks and values associated. Not let us add the lines to denote the cut off values of completeness we want to consider i.e. higher than 0.5 as inventory completeness values for cells having number of records greater than 1000. If you have suggestions on improving the features of package bdvis please post them in issues in Github repository and any questions or comments about this post, please poth them here. Asase, Alex, and A Townsend Peterson. 2016. “Completeness of Digital Accessible Knowledge of Plants of Ghana.” Biodiversity Informatics, 1–11. doi:http://dx.doi.org/10.17161/bi.v11i0.5860. Barve, Vijay, and Javier Otegui. 2016. “Bdvis: Visualizing Biodiversity Data in R.” Bioinformatics. doi:http://dx.doi.org/10.1093/bioinformatics/btw333. This is the third part of the of the post where we are replicating the figures from a paper and in this part we are going to create figure 2 the Chronohorogram. 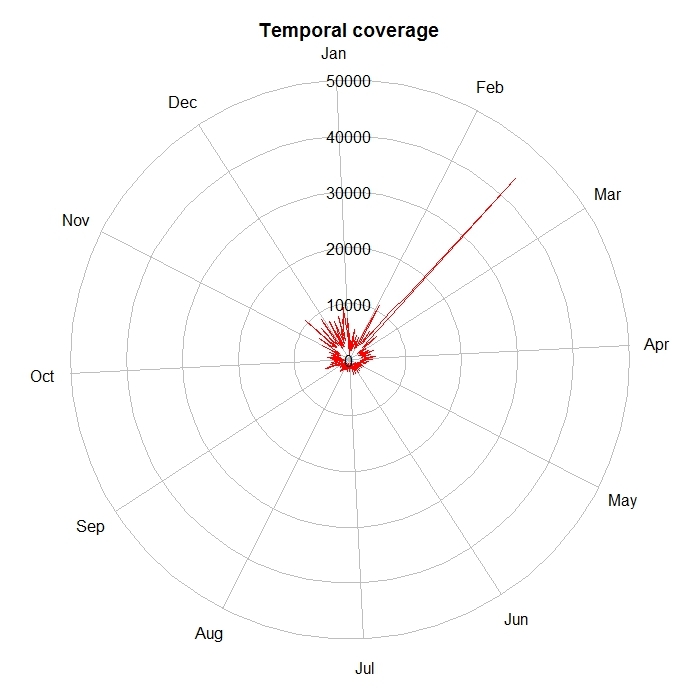 Part 2 of this series we created temporal plot for understanding seasonality of the data records (Figure 1b). If you have not already done so, please follow steps in Part 1 of the post to download and set up the data. Make sure you have v 0.2.9 or higher installed on your system. To create a chronohorogram, is really very simple using our package bdvis. Though the command has created the diagram, it does not look right. The diagram does not cover the range of all years, represented in the data. Since we have used command without many paramaters, it has used default year values for start and end. Let us check what is the range of years we have in the data. For that we can simply use command bdsummary. This tells us that we have data available form 1700 till 2015 in this data set. Let us try by specifying starting year and let package decide the end year. Looking at the diagram it is clear that we hardly have any data for first 150 years, i.e. before 1850, so let us generate the diagram with starting year as 1850. The diagram looks good except the points look smudged into each other, so let us reduce the point size to get the final figure. Continuing from Part 1, in case you have not done so, please set up the data as described before we try to make this temporal polar plot. To create Figure 1b. Graph showing accumulation of records through time (during the year) we need use function tempolar. This name ‘tempolar’ is simply a short of ‘temporal polar’. For this plot, we just count records for each Julian day, without considering the year. This tells us about seasonality of the data records. Let us continue from the the previous part with code too, if if you do not have the data set up, please visit Part 1 and run the code. First create just a very basic tempolar plot. This graph looks very different than what we want to create. This is plotting the data for each day, but the plot we want is for monthly data. Let us sue timescale = “m” to specify monthly data aggregation. So now this is what we expected to have as a figure. One final thing is to add a better title. 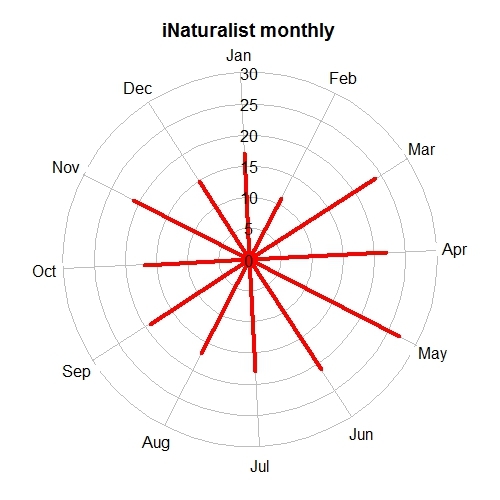 Currently the tempolar does not have ability to display values for each month. Is that very important and needs to be added? We would like to hear form the users. If you have suggestions on improving the features of package bdvis please leave comments Github repository. Recently I got to read the paper about Completeness of Digital Accessible Knowledge DAK by Alex Asase and A. Townsend Peterson. I really enjoyed reading the paper and liked the way the figures are presented. There is a lot of overlap of this with my work on package bdvis (of course under guidance of Town Peterson). So I thought I will share some code snippets to recreate figures similar to the ones in the paper using package bdvis. Since I do not have the copy of the data in the paper, I am using data downloaded from GBIF website. 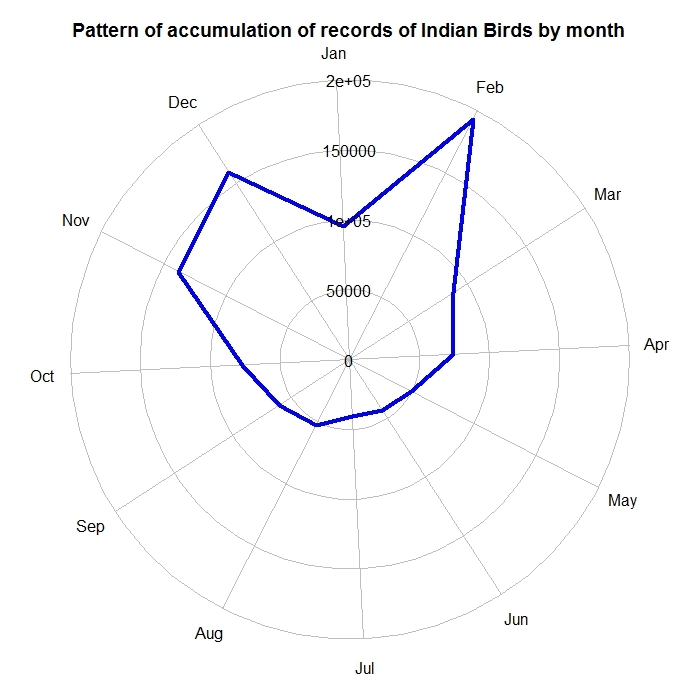 I decided to use Birds data for India. To create Figure 1a. Graph showing accumulation of records through time (years) we need to set the data in bdvis format and then use function distrigraph. The graph shows what we wanted to show, but we would like to modify this a bit to look more that the Figure in the paper. So let us exclude some more data and change the color and width of the lines in the graph. 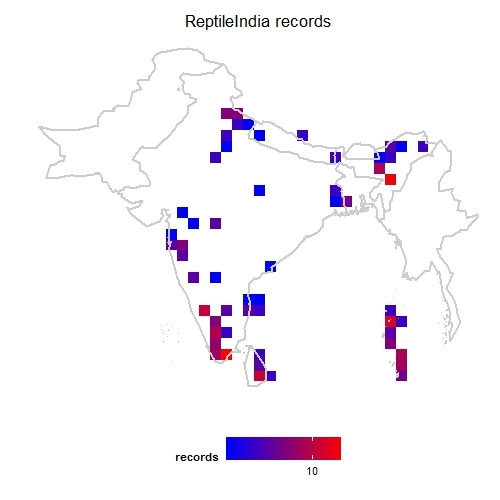 Biodiversity data visualizations using R would be helpful to understand completeness of biodiversity inventory, extent of geographical, taxonomic and temporal coverage, gaps and biases in data. As part of Google Summer of Code 2014, we hope to make progress on the development of this package and the proposed additions are posted here. If you have never used package bdvis the following code will give you a quick introduction of the capabilities of the package. We need to convert the data in bdvis format. Use fixstr function to change names of two fields. Use getcellid function to calculate grid numbers for each records with coordinates. Use gettaxo function to fetch higher taxonomy of each record. This function will take some time to run and might need some human interaction to resolve names depending on the data we have. Our data is ready for trying out bdvis functions now. First a function to see what data we have. Now let us generate a heat-map with geography superimposed. Since we know this project is for Indian subcontinent, we list the countries we need to show on the map. For temporal visualization we can use tempolar function with plots number of records on a polar plot. The data can be aggregated by day, week or month. 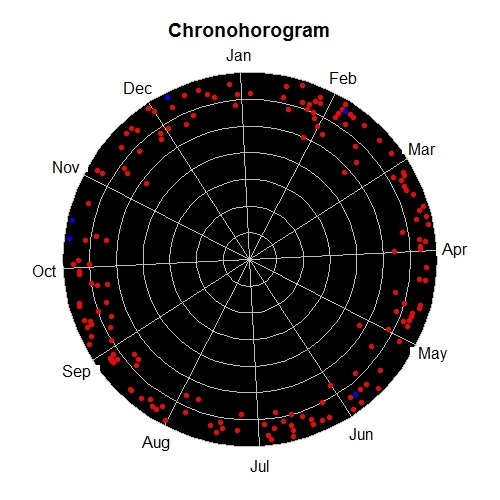 Another interesting temporal visualization is Chronohorogram. 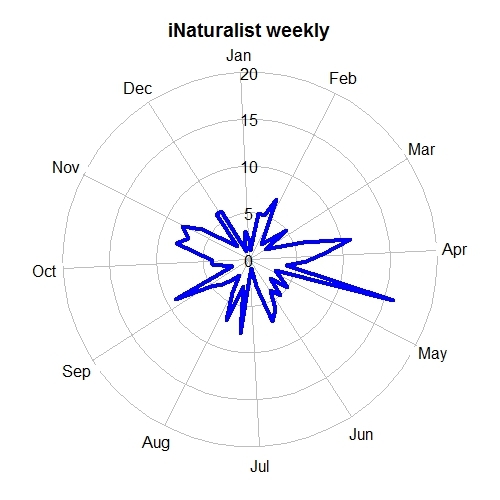 This plots number of records on each day with colors indicating the value and concentric circles for each year. 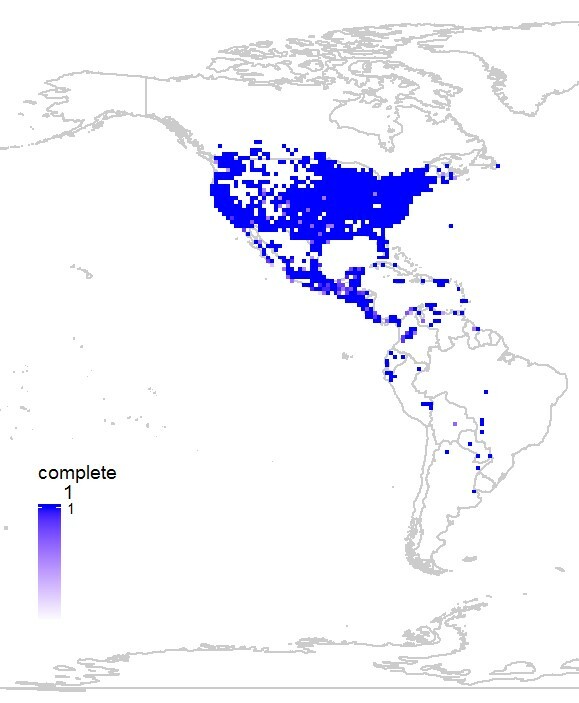 And finally for taxonomic visualization we can generate a tree-map of the records. 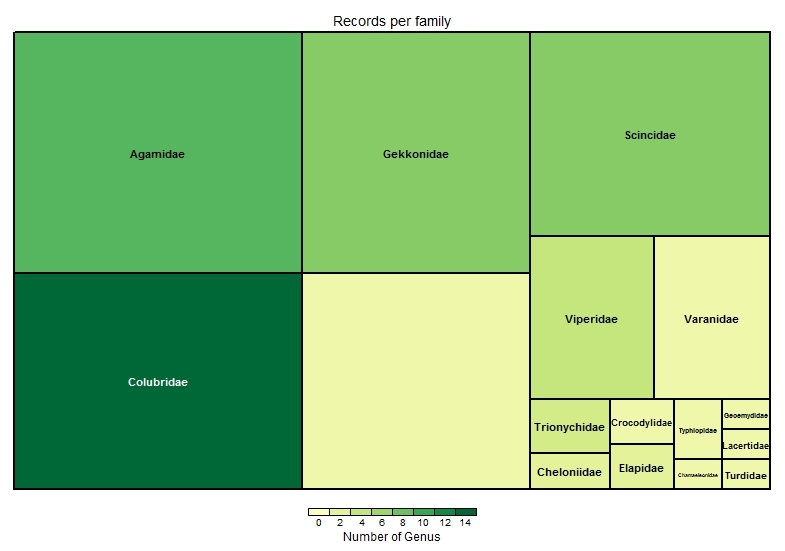 Here the color of each box indicates number of genus in the family and the size of the box indicates proportion of records in the data set of each family. The large empty box at bottom center indicates there are several records which are not identified at family level. Check the post GSoC Proposal 2014: package bdvis: Biodiversity Data Visualizations for what to expect in near future and comments and suggestions are always welcome.